A while back I created a list of top 10 sites for creating timelines. Well, since that time mobile learning has really integrated into education and apps have been developed to accomplish this task. I've created a new list combined w/ apps & sites that are ideal for creating timelines. *Definition - "A timeline is a way of displaying a list of events in chronological order, sometimes described as a project artifact. It is typically a graphic design showing a long bar labelled with dates alongside itself and (usually) events labelled on points where they would have happened. 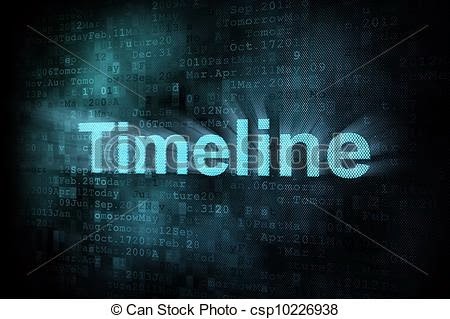 Timelines are often used in education to help students and researchers with understanding the order or chronology of historical events and trends for a subject. When showing time on a specific scale on an axis, a timeline can be used to visualize time lapses between events, durations (such as a lifetimes or wars), and the simultaneity or overlap of spans and events. (Wikipedia)"
American History Timeline - A excellent iPad for viewing America's history. Also, there are interactive educational games to reinforce student learning. Capzles - Is one of the most popular sites around for creating interactive timelines. These timelines can contain all kinds of media (images, video, etc) as well as be embedded into a site/blog. Dipity - A fun site for creating embeddable interactive timelines that include images and videos. littleBIG History - A terrific iPad app for viewing timelines from the creation of the universe to current events. This app contains over 700 images and 1300 events that can be searched through. myHistro - A great site/iOS app for creating interactive timelines w/ educational portal. Also, has the ability to embed Google Maps. OurTimeLines - A neat site w/ templates for creating timelines through text. Preceden - A cool site for creating layered interactive timelines. These timelines can be set to public or private and even be embedded into a site or blog. RWT Timeline - Based on their website's (ReadWriteThink) timeline creator, RWT is one of my favorite iPad apps (free) for creating stunning timelines. Also, the app allows for multiple users which is ideal for those schools that share devices. Tiki-Toki - A wonderful site for creating beautiful looking 3D timelines w/ images and videos. A paid account lets users embed them on a site and collaborate on them w/ multiple users. Time Rime - A great site for creating interactive timelines w/ educational portal. Timeglider - One of my favorite sites around for creating interactive timelines that can be embedded into a site. Also, a user can generate a legend/key to help navigate their timeline. Timeline - A robust iPad app for creating timelines w/ the ability to generate reports. Timelines.tv - A wonderful site for viewing timelines in 5 different historical categories. Timestream - A nice iPad app for creating timelines w/ images, that allows a user to email them or print off as a PDF. Timetoast - A wonderful site for creating a timeline that can be embedded into a site or blog. Best of all, a user can choose to view their timeline in standard mode or in text view only. Timeline 3D - An innovative app for creating stunning 3 Dimensional timelines w/ images and videos. Also, Timeline 3D can be exported into PPT or Keynote for other options. Timeline Builder - A excellent iPad app for creating beautiful timelines w/ images and lots of themes to choose from. Timeline Maker - A popular iPad app for creating timelines by stacking up tiles or events. Timeline Maker (Soft Schools) - A simple site similar to RWT, that allows users to create a timeline through text/template. WhenInTime - A great user-friendly site for creating embeddable timelines.